The Vampire Diaries didn't just conclude its first season last night. It concluded its first season in suspenseful, stunning fashion. Did you see Katherine's return coming? M.L. House: I was so in the dark about it that when my wife complained that Elena's kissing of Damon, immediately after expressing her love for Stefan, was "out of character," I told her to hush up and go with it. I learned my lesson: never doubt your wife, and never doubt the show's ability to surprise. LJ Gibbs: Not at all. The show had the advantage of Katherine also being played by Nina Dobrev, but it was still masterfully kept under wraps. With everything else that just transpired, I wasn't even thinking about Katherine, making me as surprised as John (although fortunately not as impaled). 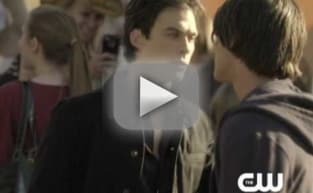 Only a second viewing of the closing segment revealed minor, subtle character differences between Katherine and Elena. The Barnacle: Did I see it coming? Gosh no. But did I have an inkling it was Katherine as soon as she glanced at Damon's ring? Yes. Do you like the new Bonnie? M.L. House: I don't like her... I love her! Loyal TV Fanatic readers will know that I bagged on how slowly-paced her storyline was at the outset of the series. I wanted to see movement on the witch front, and we've certainly gotten it. At some point, Elena will have to choose between Bonnie and Stefan, a decision I can't wait to see unravel. LJ Gibbs: Absolutely. Her clever deception in leaving the device functional, her compassion in helping Stefan save Damon, and her boldness in threatening to lay the supernatural smackdown on them if they cross her again were all tremendous developments for a character who seemed boring for so long. Plus, her hairstyle's hotter now! The Barnacle: She's a bit of a drama queen. Yes, vampires contributes to your grandmother's death and once tried to kill you. You're a witch! Get used to it and don't take it so personally. M.L. House: Yes. Not everyone on the series can be some sort of creature or have some kind of evil intention. We need the Matts and Carolines of Mystic Falls to ground the show in human reality a bit. LJ Gibbs: I hope so. You'd think the writers would have killed her off last night had that been the intention. I feel like, as with Bonnie, Caroline is destined to have a greater purpose on the show at a later point, it's just a question of what. The Barnacle: No. The show is likely to feature Tyler's transformation into a werewolf next season and it will add gravity to the storyline if he killed his best friend's girl. M.L. House: Into a vampire? No. Into an interesting character? Yes, he already has. LJ Gibbs: No. Those pill overdose suicide attempts rarely work. The EMTs always find you and pump your stomach in time - trust me. He'll probably throw up the vampire blood in the process, too! Not very well thought out, Jeremy. The Barnacle: I doubt it. A key aspect of the series of Elena fighting to protect her loved ones. That will be difficult if yet another one of them ends up as a vampire. What will you do on Thursday nights this summer? M.L. House: Hello?!? There are Vampire Diaries reruns on AND the addition of Moonlight to the CW schedule. I'll be on my couch like usual, cloves of garlic in hand. LJ Gibbs: Creep around the woods pretending I'm a vampire, preying on susceptible animals. That, or sleep more. The Barnacle: Use the Founder's Day costumes as inspiration for my fashion collection: Bloody Beautiful, by The Barnacle.